Choose from over 60 classic flavors, and discover the rich taste and quality consistency in each and every DaVinci Gourmet product, including this classic toasted marshmallow flavoring syrup! DaVinci Gourmet flavoring syrups are made from pure cane sugar to complement your beverages without overpowering them with too much sweetness. They are specially formulated to resist curdling in milk and hold up well under heat, making them the perfect choice for espresso-based drinks, coffee, and lattes. Offer a s'mores frappe, elevate the flavors of your hot cocoa, or create a marshmallow cocktail garnished with a toasted marshmallow for enhanced presentation. It can even be used as an ingredient in a wide array of baked goods, like brownies and cookies! This is a smooth and subtle taste. It mixes well with other flavors like caramel or chocolate to really bring out its marshmallow flavor. Perfect for hot drinks. During the holidays we make a smores latte. It is something our customers look forward to every year. This marshmallow flavoring just tastes so good in coffee. Not the best product. It was not the best syrup that we’ve used from Davinci and we’re a little turned off right away due to the artificial scent. A lot of people prefer to use this version instead of the sugar free version that they offer. This one does not leave any kind of bad aftertaste in your mouth like the sugar free version does. The toasted marshmallow syrup from DaVinci is wonderful. The syrup smells just like a real life campfire marshmallow and the syrup is wonderful for flavoring beverages. This is a syrup that we use in several of our drinks and the customers love it. It doesn't require a lot of syrup for a great flavor. Toasted marshmallow syrup is the perfect amount of sweet for any coffee beverage. We tend to use this in our espresso beverages and is great for hot or iced the flavor is never lost and lasts till the very end of the cup. This syrup was surprisingly good. DaVinci doesn't always land with the odder syrup flavors, but this one goes well with chocolate for S'mores flavored drinks. Good flavor I use it for coffee and my daughter for her cocoa, she loves the taste but say needs more than 6 pumps to really give it a strong flavor. The DaVinci Toasted Marshmallow flavor is great. As a Secret we add a little bit to our hot chocolates to give them that Chocolate with marshamallows taste. Customers love it. This has a very pleasant taste and aroma. It is especially great in hot cocoa. It is also great for flavoring frostings and creme fillings. DaVinci's toasted marshmallow syrup is perfect for making fall flavored specialty drinks. Our cafe customers love the genuine flavor and consistency of this product. Great buy! Yum!! I think I have a new favorite DaVinci syrup! The Toasted Marshmallow tastes just like it should. My customers really like it mixed with a mocha. I call it a "S'more Latte". It tastes like summer. It is also really good on ice, or blended like a frappe. 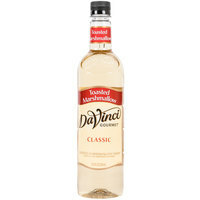 Buying the DaVinci syrup from Webstaurantstore.com is the best way to go, because they are cheaper, and usually arrive within 2 business days. I am ordering more right now! Toasted marshmallow flavoring from DaVinci is amazing. My husband and I love to use toasted marshmallow along with chocolate syrup to our hot expresso for a wonderful flavor that is smooth without the bad after taste. This is one of our most popular flavor mixes! It adds just the right amount of marshmallow flavoring to our drinks! It is definitely a must have in our store! This coffee syrup is delicious and does have a noticeable toasted flavor. We use it in coffee drinks on our food truck in the fall. What a fun flavor! This toasted marshmallow syrup is a must for making fun coffee drinks or milkshakes! Really has a genuine marshmallow flavor everyone loves! This syrup is so good. Two words for you, smores latte!! Put this in your hot chocolate and experience what you'll never want to miss again! I use this syrup in conjunction with chocolate syrup to create a s'mores coffe. It takes me back to my childhood camping trips, where we used to sit around the fire and roast marshmallows. What a wonderful product from DaVinici! the Toasted Marsh mellow syrup! it has a great campfire roasted marsh mellow Taste and works well with our espresso! I absolutely love DaVinci's Toasted Marshmallow syrup. Taste like real toasted marshmallows without the burned taste like many other competitors may have. Excellent for espresso's.. especially if you top with DaVinci's Spicy Chocolate Syrup. Buy here at webstaurantstore.com for the best service and prices the web has to offer! Found the DaVinci Gourmet Syrup here for the best price. The more you buy the cheaper it is. Very satisfied with how fast it arrived at my doorstep too. Would recommend webstaurantstore to anyone looking for a great deal and a good product! This is a very good flavor. I use it in all sorts of things from coffee to hot cocoa. It is good in cake and cookie batter and can also be used in oatmeal. This is the only DaVinci syrup I'm disspointed in so far. Don't get me wrong, it is good. It just doesn't taste like a toasted marshmallow to me though. More like a creme brulee flavor.